On this page, we battle top brands side by side. Read our in-depth comparison and decide on which one may better suit your specific sleeping needs and preferences. Memory foam, known for its pressure relief, deep compression support and body contouring properties, was first created by NASA in the 1970s. In the 1990s it began to grow in popularity and today we have a great variety of memory foam mattresses that differ in construction and the feel they provide so it may be hard for you to find the right fit for your needs. 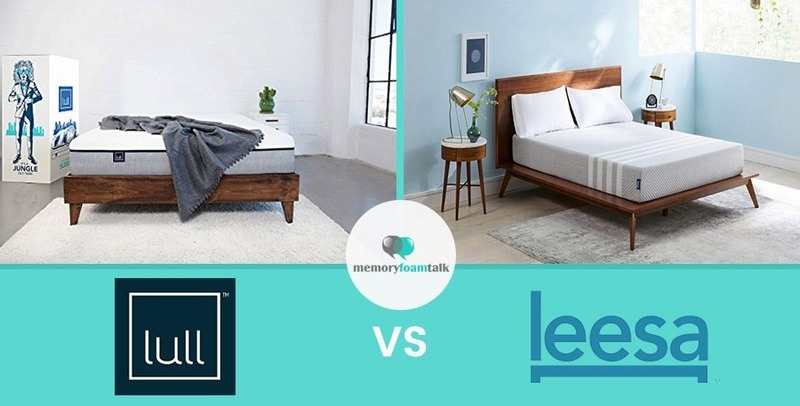 To help you realize all the benefits of memory foam and find the mattress that will best work for you, in this review we’ll be comparing two luxury memory foam mattresses: Loom and Leaf vs Nectar. These are considered to be the highest-quality memory foam mattresses available on today’s market, and maybe one of them may be the right match for you. Tomorrow Sleep is a foam and pocketed coil hybrid, while the Nectar is an all-foam mattress that recently hit the market with its high-quality materials and reasonable price. Further in this review, you will see how they compare, and you can determine which better suits your preferences and your budget. In this review, we’ll present you with the basic characteristics, pros, and cons of each mattress to make your decision easier and help you pick the right one for your needs. Few things feel as good as a quality night’s sleep. This is especially true if sleep seems to escape you continuously night after night. If you’ve heard about all foam mattresses and all their ability to provide extraordinary comfort and rest, you may wonder if one of them could possibly improve the quality of your sleep. In this review, we’ll be comparing Nolah and Nectar, two highest quality all foam mattresses present on today’s market, to help you realize all the benefits of all foam mattresses and pick the right one for you. Both Nolah and Nectar mattresses are durable and extremely comfortable, coming in at a fraction of prices of the in-store brands. Both sleep quite cool and both can provide you with a sound and undisturbed sleep, but which can better suit your needs and preferences? Let’s find out. Buying a new mattress used to be a tedious thing to do before the explosion of the online mattress companies took place. It involved visiting retail stores and lying on different mattresses for hours in an attempt to find the right one, but online mattress companies and their growing popularity changed everything and made getting a new mattress easier than ever. In today’s Lull vs Nectar review, we’ll take a look at two such companies. Both offer the highest quality all foam mattresses at a fraction of the price of the in-store brands and both have high customer satisfaction rates. But, which one may have the right mattress for your needs? To illustrate all the benefits of memory foam mattresses incorporating special technologies within their construction, we have picked two highest-quality all foam mattresses, Bear and Nectar that we’ll compare in today’s review and help you realize why an all foam mattress may be the right pick for you. If you are looking for a high-end memory foam mattress online, there is a good chance you’ll come across Novosbed and Nectar. These are two luxury all foam mattresses coming from two popular online-only companies that sell highest-quality memory foam mattresses at a fraction of the price of the in-store brands. In this Novosbed vs Nectar review, we’ll show you how these two mattresses compare to each other and why they are unlike many other memory foam mattresses present on the today’s market. We’ll present you with the basic characteristics and benefits of these two mattresses that may help you make a more informed decision on which one would be a perfect pick for you. In today’s Puffy vs Nectar review, we’ll be comparing two mattresses that offer a luxurious, cloud like feel promising optimal comfort and support. If this sounds like what you look for in a mattress, maybe one of them will be a perfect match for your needs. When it comes to buying mattresses, there are literally thousands of options to choose from. Such an endless selection makes finding a mattress that will suit all your needs and sleep preferences very difficult. One of the most important things to pay attention to when choosing a mattress is its comfort. A comfort of a mattress mostly relates to how soft or firm a mattress feels, and so mattresses can range from very soft to very firm. These are the Puffy and the Nectar mattresses. Both are relatively new on the market, and both offer a luxurious, cloudlike feel and an optimal level of comfort and support necessary for a quality night’s sleep. Choosing the right mattress is no easy task, especially if you have to choose between two luxury hybrid mattress brands such as the Tomorrow Sleep from the makers of Serta/Simmons and the DreamCloud Sleep that recently hit the online market. Both are high-quality mattresses made of premium pocketed coil and foam materials, and both have the specific features that set them apart from most other mattresses we have tried out. This review will provide you with a useful information about these two mattresses, their characteristics, benefits, and basic differences, and it will help you realize which one would be perfect for you. We are back with another comparison. Today it will be between the two innovative and luxury hybrid brands: Brentwood Home Oceano and DreamCloud. Both are combinations of foam materials and innerspring coil systems, and both come at a fraction of the price of the in-store brands. The Oceano has been Brentwood Home’s best-selling bed for a while, whereas the DreamCloud is a recent hybrid mattress that has rapidly grown in popularity due to its high-end materials, quality construction, and unsurpassed customer service. But the question is: Which one would be a better choice for you? Keep reading to find out. These are popular and unique mattress brands. They both bring several innovations to mattress industry and while one features special copper-infused memory foam for additional cooling, the other uses its own proprietary Air Foam, but which one is better? In today’s review, we’ll be comparing two luxury all foam mattresses that sell primarily online: Layla vs Casper. Both have their specific features that set them apart from other all foam mattresses, and while the Layla is a double-sided mattress offering two firmness options in one bed and the first mattress featuring copper-infused foam, the new updated Casper is a universal comfort model designed to suit a wide range of sleepers with different sleeping styles. Read our review and find out which one of these mattresses may be a perfect pick for you. Keep reading to find out in our Loom and Leaf vs Layla mattress review. Both Tomorrow Sleep owned by Serta Simmons Bedding and Layla Sleep are recent entrants to the market, and they are bringing many innovations to the mattress industry such as the mattresses that we will be reviewing in today’s comparison. Loom and Leaf and Leesa are two very popular online mattress retailers, who have made quite an impact on the mattress industry in the last few years. Both offer mattresses at a fraction of the price of in-store brands, while providing similar if not better quality than much more expensive popular brands, but which would better suit your needs? That all depends on what you are looking for in a mattress. Read our review and find out more details about these two mattresses. Keep reading to see what we think about them and how these two mattresses compare to each other. We’ll present you with the basic characteristics and interesting similarities and differences between the two that you should consider if you are thinking of purchasing one of these mattresses, and that may help you decide which one would be a better choice for you. Does your body ache every morning? Are you restless and sleepless? A memory foam mattress can help eliminate these problems and make you feel better. Memory foam is known for its pressure relieving properties, deep compression support, and conforming abilities. It perfectly molds to your body, distributes its weight evenly across the bed, and allows a comfortable and painless sleep. In this review, we’ll be comparing two mattresses, entirely made of memory foam that come from two well-known mattress companies: Loom and Leaf and Bear. Keep reading to find out what are their characteristic features that set them apart from many other memory foam mattresses available on today’s market, and pick the right one for your needs. Shopping for a new mattress is not an easy task. There is a wide range of options to choose from, and you soon may find yourself overwhelmed by such a great variety of choices and prices. We understand that choosing your new mattress is not a decision you can make without careful consideration, especially if you are not sure whether to pick a coil/memory foam hybrid or a full memory foam mattress. To help make your decision easier and help you find out which option is right for you, in today’s review we’ll be comparing the Tomorrow Sleep, a combination of springs and memory foam, and the Loom and Leaf, a full memory foam mattress. Read our comparison and see why one of these memory foam mattresses may be ideal for you. Are you looking for a new all foam mattress? Have you considered purchasing the Puffy universal comfort mattress or one of the Loom and Leaf models? In this Puffy vs Loom and Leaf comparison, we take a look at two popular online mattress brands. Both are luxury all foam options, and both incorporate unique technologies aimed at improving the overall comfort and sleep experience which make them unlike any other all foam mattresses currently present on the market. In this comparison, we’ll present you with the basic characteristics and benefits of these two mattresses and personal experiences and opinions about them and help you figure out a better pick for your sleeping needs and preferences. If you are currently looking to buy the best mattress for your needs, but you are not sure which one to choose, our review might help you bring your decision easier. 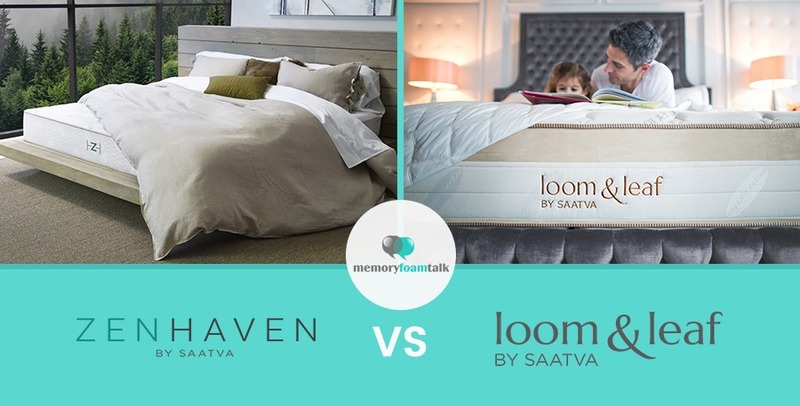 This comparison focuses on two high quality memory foam mattresses, Novosbed vs Loom and Leaf, coming from two heavyweights of memory foam mattress industry. Both are luxury all foam mattresses offering multiple firmness options designed to suit a wide range of sleepers with different needs, and both have extraordinary customer service, but which one would be an ideal match for your specific needs and preferences? Read our review and find out. You spend almost a third of your life in bed, which means that choosing the right mattress is of crucial importance. The wrong one can lead to sore muscles, insufficient sleep, headaches and many other health issues, while a sound night sleep in a quality bed can improve your overall health and generally add up to a better you. Today we will be comparing two high-quality hybrid mattresses made of premium materials with elegant and soft finishes. One is Tomorrow Sleep, a 10″ hybrid pocketed coil and foam mattress, and the other is a brand new handmade Brentwood Home Oceano memory foam and innerspring hybrid. In today’s review, we will be comparing two hybrid mattresses coming from two popular online mattress retailers Tomorrow Sleep and Helix Sleep. Both Tomorrow Sleep and Helix Sleep offer multiple options for mattresses online, and while Tomorrow Sleep offers just two firmness options – Medium Soft and Medium Firm, Helix Sleep personalizes mattresses based on sleeper’s answers from a questionnaire. When it comes to choosing mattresses, depending on the kind of comfort you need and your preferences, you have many options to choose from, and hybrid mattresses and all-foam mattresses are currently the two most popular construction types on the market. Today’s comparison will be between the Tomorrow Sleep, a pocketed coil and foam hybrid, and the Leesa, an all-foam mattress. These are the popular bed in a box brands, but which one is the right for you? Let’s take a closer look at them and find out. Today we will be comparing two hybrid mattresses: Avocado (latex and coil hybrid) with Tomorrow Sleep (foam and coil hybrid) coming from the makers of Serta/Simmons. Avocado is an eco-friendly combination of latex and coil offering a good degree of bounce and responsiveness while Tomorrow Sleep, introduced in June of 2017 by the industry heavyweight Serta/Simmons, was released to attempt to use all the years of expertise and innovations from the company to enter the new online direct-to-consumer mattress market. Read our comparison and decide which one of these mattresses may be the right pick for you. Both are highest-quality “green” mattresses, composed of all natural, eco-friendly, and organic materials. Both are, therefore, suitable for those sensitive to off-gassing and those suffering from airborne allergies, and both offer a luxurious feel and extraordinary sleeping experience that will help you get more out of your rest. But which one will better suit your preferences and specific needs? Let’s find out. Are you in the market for the new mattress? Are you looking for the well-known brands of mattresses made up of the highest-quality materials? If so, then the Brentwood Home Cedar and the Zenhaven mattress from the makers of the Saatva and Loom and Leaf mattresses should definitely be considered. The Brentwood Home Cedar is a new natural latex and micro-coil hybrid mattress that Brentwood Home recently released while the Zenhaven is an all natural latex mattress. Both are made of all natural, eco-friendly materials, and both possess the qualities that make them capable of providing you with sound and luxurious sleep. This review will present you with the basic characteristics and benefits of both, and help you find out which one would better suit your needs. You are not sure which one would be better for you? Let’s take a closer look at both of them and we’ll find out. The models we’ll be comparing in today’s review, the Brentwood Home Oceano and Brentwood Home Cedar, are not an exception either. We are back with another comparison. This time we’ll be comparing the 100% all natural latex Zenhaven with the latex/coil hybrid Avocado. Keep reading to learn the basic characteristics and benefits of both mattresses, and you’ll eventually find out which one would better suit your specific needs and preferences. Keep reading to see which one would better meet your needs. These are two different types of mattresses coming from different companies, and while the Tempur-Pedic Cloud Luxe Breeze is an all foam mattress coming from Tempur Pedic’s full line of foam mattresses catered to different firmness levels and feels, the Helix is a customizable, hybrid mattress capable of meeting everyone’s needs and preferences. We are back with another battle. In today’s review, we’ll have one of those traditional and old-school vs. new and innovative debates as we compare Leesa vs Tempur Pedic. Tempur Pedic is a memory foam mattress pioneer and a leading brand name in the luxury mattress market, while Leesa is a newcomer to the industry growing impressively since 2014 and focusing mostly on online selling. Let’s take a closer look at them to see how they compare and which could be your perfect sleep match. Read our review and find out whether one of these highest-quality memory foam mattresses may be the right pick for you. Memory foam mattresses such are Bear and Tempur Pedic that we’ll be comparing in today’s review can provide ultimate support for your whole body, mold and conform to it perfectly, and evenly distribute your weight across the bed. Their specialized technology and contouring abilities may be an ideal solution for your achy joints, morning pains, and restless sleep. Keep reading to find out all the specific features and benefits of these mattresses and pick the right one for your needs. Today’s Novosbed vs Tempur Pedic review focuses on two high-quality memory foam mattresses coming from two well-known mattress companies. While Tempur Pedic is a memory foam mattress industry’s heavyweight, Novosbed is a newer company, but they have also built a very strong reputation among their customers due to the quality of their sleep products and extraordinary customer service. Whose mattress can better meet your specific needs and preferences? Read our review, and you’ll find out. Are you looking for a mattress with a softer feel? Do you want to feel like you’re sleeping on clouds? If so, you should know that buying a high-performance soft mattress is not an easy thing to do. In this review, we’ll be comparing two soft mattresses: Puffy vsTempur Pedic to help you avoid the tedious process of choosing. There are a wide range of choices available on today’s market, and it may be hard for you to pick a quality soft mattress that will suit all your needs and sleep preferences, but that will also maintain its original shape, comfort and support properties regardless of how long you use it. Both the Puffy and Tempur Pedic Cloud Luxe Breeze are all foam mattresses, both feel soft to the touch, and both provide the right balance of comfort and support necessary for a continuous and restful sleep, but which one would better suit you? Buying a new mattress wasn’t so simple a decade or two ago. It involved visiting mattress stores and selling departments and lying on mattresses for hours only to realize that nothing is good enough. But, the recent explosion of online mattress companies made getting a new mattress easier than ever before. These online mattress brands offer a wide variety of mattress types which will spare you from visiting retail stores and from all the hassle that can result from negotiations with salespeople. All you have to do is to make your decision and pick the mattress that will best suit your specific needs and sleep preferences. But how to choose between two luxury mattresses such as the Sabrina, a 12″ thick memory foam and Dunlop latex hybrid and the Tempur-Pedic Cloud Luxe Breeze that comes from one of the online mattress industry heavyweights. Which one would better work for you? Let’s find out which may be the right match for you. Sleep plays a crucial role in good health and well-being throughout your life. Getting enough of quality and sound night’s sleep can help protect both your physical and mental health, improve the overall quality of your life, and your safety. A comfortable night’s sleep is especially important for those with an active lifestyle and to help them get enough of it, we have selected the two unique all foam mattresses with special features that we’ll be comparing in today’s review: Nolah and Bear. Are you looking for a mattress of the right firmness level capable of suiting all your sleeping styles? Have you considered purchasing one of the universal feel mattresses? In today’s review we’ll be comparing two such mattresses: Nolah vs Casper. These are 10“ thick mattresses made entirely of foam, and while the Nolah uses its own proprietary Nolah Air Foam that sleeps cooler than memory foam and is more durable than latex, the Casper combines multiple layers of polyfoam and memory foam to make one of the most comfortable beds in the online bed-in-a-box market. Read on to find out how we felt about these two mattresses and see which one will be a better fit for you. If you wake up feeling tired or achy, or you tend to sleep better at hotels than at home, if your mattress looks saggy or lumpy or is at least five to seven years old then you should consider buying a new mattress. In this Puffy vs Nolah comparison review, we’ll be comparing two highest-quality all foam mattresses available on today’s market that may help you solve your problem and sleep like a baby again. The Puffy offers extraordinary back pain alleviation with its Adaptive Cloud technology and the feeling of sleeping on clouds, and the Nolah uses its own proprietary Nolah Air foam that provides excellent pressure point relief, retains less heat and is more durable than other types of foam. Read on and find out which one of these mattresses may be the right match for your needs. We are back with another comparison. This time again it will be between two all foam mattresses highly rated by many customers: Puffy and Bear. The Puffy is a popular bed-in-a-box mattress ideal for those with a lighter build as it has a softer, cloud-like feel to it. Bear, on the other hand, offers a somewhat firmer feel and is unique in that it is the only mattress that incorporates special Celliant technology aimed at helping with pain and muscle recovery, diffusing heat and stimulating a deep and sound sleep. Does this sound interesting to you? Read our review and find out how these two mattresses compare to each other, what are their unique characteristics and benefits, and pick the one that would best work for you. With such a great variety of high-quality all foam mattresses available online, you no longer have to visit local showrooms and try out mattresses for hours hoping that you’ll eventually pick the right one and that it will remain comfortable for the next decade or two. In this Lull vs Puffy comparison, we take a look at the Lull with its proprietary blend of poly foams and memory foams designed to provide a perfect contour to your body and pressure point relief, and the Puffy, which promises a great sleep at more than a reasonable price and is designed to suit a wide range of sleepers with different sleep preferences. Which one of these mattresses will best suit your specific needs and preferences? Keep reading and you’ll find out. In today’s review, we’ll present you with the characteristics and benefits of two 100% latex mattresses: Zenhaven and Spindle. Long are gone the days when you had to drive to the mattress store and lie around on different mattresses for hours only to discover that none suits your needs and leave the store empty-handed. Mattresses are now available online through a large number of online mattress retailers that offer innovative, user-friendly, and hassle-free online shopping experiences. Mattresses that are sold in this way come with many conveniences, and they are generally cheaper and of higher quality like the Helix and Brentwood Home Oceano that we’ll be reviewing in this comparison. 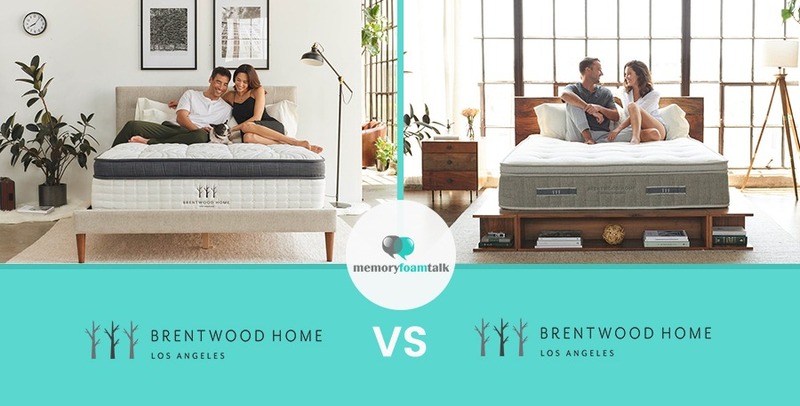 Brentwood Home Oceano is the new memory foam and innerspring hybrid mattress in Brentwood Home’s premium mattress line, while the Helix mattress, coming from Helix Sleep, is personalized, custom made to order mattress, shipped to your doorstep at a fraction of the retail price. We are back with another battle. Today it will be between two highest-quality hybrid beds: Helix and Leesa Hybrid (Sapira). The Helix is a customizable hybrid that allows you to create each side of the mattress according to your and your partner’s individual needs and preferences, while the Leesa Hybrid (Sapira) is a luxury combination of pocketed coils and layers of various foams. But, how to know which one will be better for you? Most sleepers are combination sleepers which means that they change their sleeping positions many times throughout the night. If you are a combination sleeper as well, finding a mattress that can perfectly work for all your sleeping positions, especially if you share your bed with a partner can be a real challenge, but is not impossible with so many mattress choices available on today’s market. In this Helix vs Casper review, we’ll be comparing two such mattress brands known for their ability to appeal to a wide range of sleepers with different sleeping styles. One is Helix, a completely customizable mattress, while the other is a new, updated universal comfort version of the Casper mattress that has gained a great popularity in the past several years. Read our review and see which one may better suit your sleep preferences. Buying a mattress online has become a popular thing to do. It is easier and more convenient than driving to a retail store and shopping for one there. Shopping for your new mattress online opens hundreds of options for you and allows you to find the one that will best suit your needs. Hybrid mattresses dominate the online market these days due to their ability to suit everybody’s preferences and weights, and in today’s review, we’ll be comparing the Oceano and Leesa Hybrid (Sapira), the two luxury hybrid models coming from the two well-known online mattress retailers: Brentwood Home and Leesa. Both are perfect combinations of different foam layers and innerspring systems, and in this review we’ll point you to the benefits of hybrid mattresses and help you realize which one would be the right choice for you. Today we’ll be reviewing two luxury hybrid mattresses, Brentwood Home Cedar and WinkBeds and present you with the features and benefits of both, as well as our personal experience having slept on both of them. In today’s review we’ll take a look at two popular mattresses coming from well-known mattress companies: GhostBed and Leesa. Both are high-quality mattresses available online and delivered directly to you via quick shipping. Both have their unique characteristics and strong points that set them apart from many other mattresses available on today’s market, but the question is, which one would better suit your specific needs and sleep preferences? We have slept on and reviewed both of these great models, so keep reading our review if you want to find out something more about these two mattresses, how they compare to each other and pick the one that would best work for you. Keep reading our comparison to see what are our opinions on Lull and Leesa mattresses. Read our review and find out which one of these highest-quality all foam mattresses may be the right one for you. In this review, we’ll present you with the basic characteristics and benefits of these two mattresses that may help you pick the one that would best suit your specific needs and preferences. We are back with another mattress comparison. This time our battle will be between the two ghosts GhostBed and Casper. Casper is widely known for helping create the online, direct-to-consumer bed-in-a-box phenomenon, and they have become quite successful in the last few years. However, they have a big competitor in GhostBed, who has been gaining in popularity recently with their high quality mattress and pillows. We have slept on both of these mattresses and in this GhostBed vs Casper review we provide our opinions and experiences with each of them that may help you pick the right one for you. Keep reading to see what we think! Read our review, and we’ll help you find out. Today again, we’ll be comparing two all foam mattresses: Lull vs Casper. Although they look pretty similar, they are very different in terms of construction and feel. The Lull mattress is a proprietary blend of highest-quality memory foams and polyfoams, while the Casper is an updated version of the old Casper model including Zoned support layer designed to provide support to the areas of the body where it is needed most and a comfortable and sound night’s sleep. Read our review to see what we think about these mattresses and what are our experiences and pick the one that will best work for your specific needs and sleep preferences. Read and find out which one may be a perfect match for your needs. In today’s mattress comparison, we’ll be reviewing the two luxury hybrid mattresses: The WinkBeds and the Leesa Hybrid (Sapira) (created by the maker of the Leesa mattress). Both are made of innerspring and foam materials and both come at a fraction of what you normally have to pay for mattresses of such high quality. If you are in the market for a new mattress, but you can’t decide between these two highest-quality mattresses, take a look at our in-depth comparison and see if this is what you are really looking for. We are back with another battle. Today it will be between two highest-quality hybrid beds: Helix and Leesa (Hybrid) Sapira. The Helix is a customizable hybrid that allows you to create each side of the mattress according to your and your partner’s individual needs and preferences, while the Leesa (Hybrid) Sapira is a luxury combination of pocketed coils and layers of various foams. But, how to know which one will be better for you? With both of them made for the same purpose and dedicated to the same market segment, you may have a tough time choosing the right one to buy. We have tried out both of them and this is our review.